Our Euro Design Profiling Bed can improve bed accessibility for those with mobility issues. Adjust the height, leg and back position to feel more comfortable. Price excluding VAT.(Incl. VAT £2,034) *VAT Relief available on this product. The Euro Design Profiling Bed is height adjustable and comes in a variety of sizes. It is made to give a high quality and modern finish. If you require an adjustable bed with great looks and a great price, then look no further than the Euro design. You can raise the bed to hip level, using the adjustable function, making it much easier to get in and out of bed. The mattress is reinforced around the buttocks area and requires less effort when getting out of bed. Attached to the head of the bed is an easy to use handset. With this, you’ll be able to control the backrest, the height of the bed, and leg angle. Twin profiling bed with variable height (two separate bed bases with independent adjustment). 3 widths available: 140, 160 and 180 cm. Electrical backrest, electronic footrest with knee-break. Head and footboards in all-wooden beech. Why Choose our Euro Design Profiling Bed? Relieves stress on the back. Electrical backrest, electrical leg rest with knee-bend. Adjustable height, suitable for all patients' sizes. Head and footboards: surround in all-wood beech, inside in plywood and melamine. Wooden surround for the chassis and the mattress platform, wood tint matching the end boards. 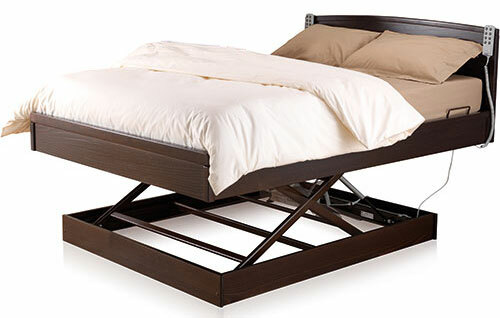 The Adjustable height single is perfect for getting out of bed because the bed rises up to hip level.